None. Strong enough to punch clean through a super-Nazi's rib cage, Zenith didn't need weapons. "I'm nineteen, I can fly, I can flatten ballbearings between my fingers and I'm practically invulnerable to damage. What can possibly go wrong?" Vanity, hedonism, and a general air of smug self-satisfaction. 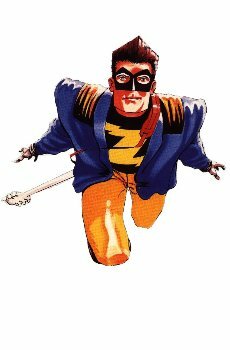 The son of former 60s super-heroes Dr Beat and White Heat, both of whom disappeared under mysterious circumstances, Zenith had little interest in super-heroics. He was more interested in good old-fashioned hedonism, using his famous heritage to bolster his singing career. His long-suffering agent, Eddie; Siadwel Rhys, aka the Red Dragon; Ruby Fox, aka Voltage; Peter St. John, aka 60s super-hippie Mandala, aka the Minister of Defence.